Prosecutors have sought the arrest of Sodalitium’s founder, Luis Fernando Figari, and a handful of other leaders. But Mr. Figari lives in Rome, where the Vatican told him not to return to Peru and instructed Sodalitium to foot the bill for his living expenses abroad. Francis recently placed a Colombian cardinal in charge of Sodalitium, but did not distance himself from the group during this trip. Instead, he shared a stage with a Sodalite archbishop, José Antonio Eguren, who introduced the pope at an event in the northern city of Trujillo. Neither mentioned the allegations. Archbishop Eguren had also been linked to the allegations. An early member of Sodalitium, he was accused of physical abuse and was initially included in the complaint that led prosecutors to close in on Mr. Figari, said Hector Gadea, the lawyer who prepared the case. But prosecutors immediately declined to investigate Archbishop Eguren, the lawyer said. “Mr. Eguren was the only Sodalite whom prosecutors declined to investigate from Day 1,” Mr. Gadea said. Archbishop Eguren’s appearance with the pope not sit well with some observers. Francis turned his attention on Sunday to the importance of church unity in Peru, a country where Catholic fervor remains high but has been decreasing. A December 2017 poll found that 75 percent of Peruvians identify as Roman Catholic, down from 85 percent a decade earlier, according to Peru’s 2006 census. 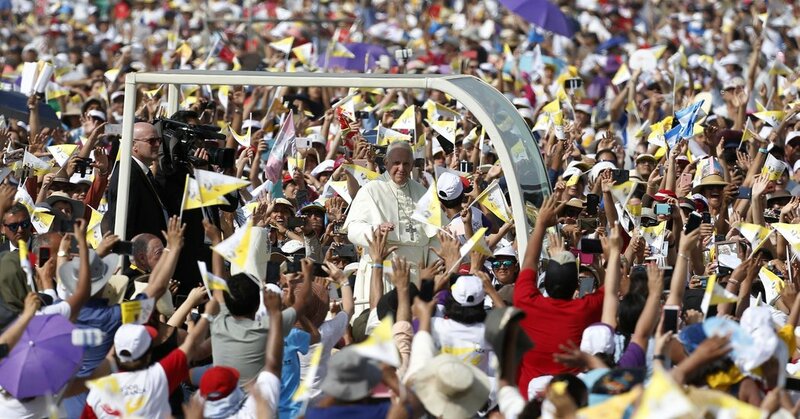 More than a million people came to see Francis at his final Mass on Sunday evening, dwarfing the turnout in Chile, which was widely described as poor. Meeting with a group of nuns on Sunday morning, Francis told them to pray for a church that is “tempted to disunite.” He also offered them advice on maintaining unity.